Both Nvidia and AMD have already dabbled in automatically optimizing the settings of PC games to match the hardware they're running on. GeForce Experience provides this service for Nvidia hardware, while a Gaming Evolved variant of Raptr does a similar thing for AMD-powered systems. Intel is also jumping in on the bandwagon, today announcing their very own partnership with Raptr at the Game Developers Conference. Like with AMD's variant of Raptr, the special Intel build crowd-sources data to find the best game settings for your system, targeting performance or quality depending on your preferences. The Intel variant of Raptr (pictured above thanks to PC Perspective) also includes gameplay recording enhanced by Intel's Quick Sync technology, which encodes the video using hardware acceleration. For gamers that aren't up to date with drivers, Raptr will notify you to download and install new builds when they become available. While many enthusiast gamers scoff at the idea of automatic game optimization, for gamers with limited graphics hardware - like you'd get from Intel's integrated graphics - squeezing out the most from your system is key. 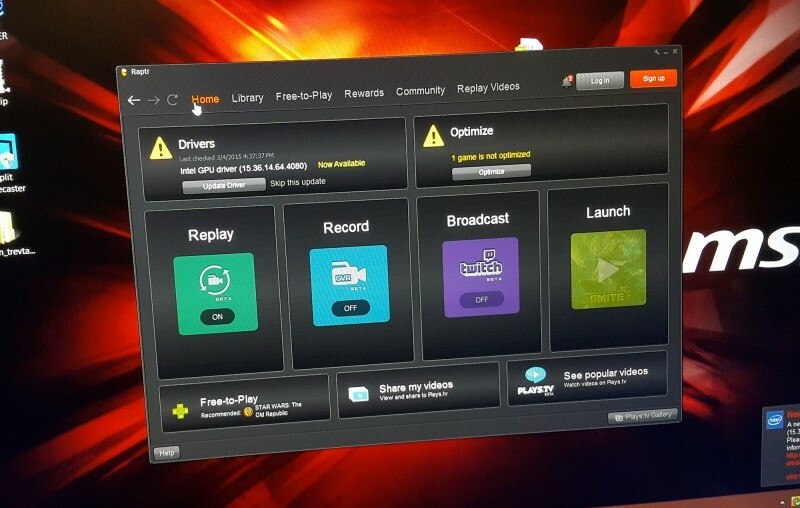 A program like Raptr could go a long way to give entry-level gamers on Intel hardware the best experience possible. The Intel variant of Raptr is available to download right now through the Raptr website if you want to try it out.